The first seven days of August 2016 was the annual ‘home alone’ week when the rest of the family go to soak up the sun in some hot resort or other and I stay at home to ‘look after the dog’. So the idea was to spend as many days down on Dartmoor as possible, well that was the theory. It rained on the Monday, poured down on the Tuesday and drizzled on the Wednesday but Thursday’s forecast was sunny spells and showers developing throughout the day. The plan was to take some photographs of a few of the Dartmoor crosses for my Dartmoor Crosses Facebook Group and visit a few Dartmoor 365 squares, if you don’t know whats that’s all about see – HERE. So having gotten up early and sped down to Dartmoor the first port of call was to be Bennett’s Cross before the holiday makers came out to play. Well the B3212 was certainly quiet and Postbridge was deserted, all was looking good. That was until I reached the Warren House Inn, on cresting the ridge I spotted a mass of fluorescent jackets and vehicles clustered around the old cross. My first thought was that there had been a dreadful accident but on nearing the scene it was obvious that a film crew was in-situ. Oh dear what a shame or thoughts slightly similar to that came to mind, apparently some students were making a futuristic film for some festival or something and the Bennett’s Cross lay-by had been transformed into a weird looking bus stop. OK, I would return when they had finished filming, afterall surely the Dartmoor national Park Authority would not allow them to cause such traffic disruption on that busy road for long – would they? The next cross on my list was Liapa Cross which was literally beside the B3212 road just past the last moorgate before Moretonhampstead so that was no sweat. What was a bit of a shock was the mantle of ivy that had grown around the old wayside cross since my last visit, but then again that was in 1996 when John Major was Prime Minister and he doesn’t look as he did back then. After clambering through a viscous gorse bush I did manage to clear the ivy away and get a couple of decent photographs as can be seen on this Liapa Cross page. Just at the entrance to the small lane that leads down to Moor Gate (once called Liapa hence the cross’s name) is a well hidden house which I had never noticed before. 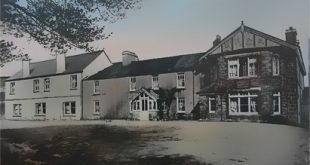 According to Eric Hemery’s High Dartmoor book at one time there was an old toll house somewhere in the vicinity which later became a small police station where the PC and his family also lived – hmmm, never knew that, you learn something new every day. Onward to the Watching Place Cross with the idea of parking up and going for a stroll. I really, really wanted a half decent photograph of Hele Cross and so rather than drive down to it I would take a wander. This meant passing the Watching Place Cross and then taking a small lane which led down to Hele and as the sun was out and the skies were blue what better prospect could one want. In theory it was just a short amble of just under a kilometre but if one ignores the plan it’s more like 1.5 kilometres when you turn right instead of left and then have to walk all the way back. As can be seen from the photograph below this lane is seldom used judging by the grasses growing in the middle of it. But hey, what a fantastic choice, take the tarmac away (which nature is slowly doing) and you could be wander along as if it was 200 years ago. The hedgerows were alive with butterflies of all descript just skipping from flower to flower and every now and again a gateway would appear offering some idyllic Dartmoor vistas. Time to stand and stare whilst leaning on the old wooden gates and reflecting on the tranquil solitude, the only sound being that of a couple of buzzards skreeling overhead. Eventually the lane began a gradual descent towards the old farm of Hele and the ancient wayside cross that stands sentinel opposite. This really is stepping back in time as it has been suggested that at one time an ancient chapel once stood below where the cross now stands which you can read more about on my Hele Cross page. As for the actual farm itself a livid Sawdye and Harris sign proudly announced that the farm had been sold, it did appear that the new owners had not yet moved in as the place seemed deserted. This is one of those remote Dartmoor properties that many people would give their right arm to own and I am no exception. Once I had returned home I Googled the property to see what it was sold for, all I could find was that it was under offer for £1,650,000 which I presume it eventually went for. But for that the owners got a Grade II listed building with 5 bedrooms etc, a tennis court, extensive gardens, farm outbuildings, 127.5 acres of land, commoners rights and oh, a potting shed. All I can say is that I hope they are very happy in their new home and should it prove to remote and quiet for them just give me a call. One very interesting aspect of the farm are the rather ornate stalls in the Dutch barn, I have been around loads of farms and have never seen anything like those as can be seen above. Just opposite the farm is a splendid George Rex postbox dating back to between 1910 and 1936 which as it states on the front is intended for letters only. Imagine your own postbox, no nipping down the pub and telling the wife you’re off to post some letters. Tempus Fugit and all that, there was still lots to do so slowly sauntering back up the butterfly lane I headed back to the car with my prize for the day. Hooked over one of the gateposts was an old rusty horseshoe and never being one for turning down good luck magnets I brought it back. Now I don’t know if it was a case of Karma for nicking the horseshoe but when I got back to the vehicle I discovered that somewhere I had lost my glasses. No big deal I hear you say, well there is a slight problem here. Not that long ago, after some intense nagging from the wife I took a trip to Specsavers. Again no big deal until you realise that the last time my eyes were tested was in 1981 when they were A1 pilot perfect. After going through all the tests the optician told me she had some good news and some not so good news. The positive bit was that my eyes were healthy with no sign of degenerative disease – thank God for that. The not so positive news was that my eyesight was below the required legal standard for driving and that every time I drove the car I was breaking the law. Needless to say some £300 later I have, sorry had some very efficient driving glasses because despite retracing my steps they were nowhere to be seen. This meant driving back some 150 miles. squinting through the windscreen and hoping nothing drastic would happen. So that was the end to the day which meant not everything got done. Oh and the film crew were still at Bennett’s Cross when I went back, well I think that’s what the blurry things were?